Usually if we only spend one night in a place I’ll combine the blog posts but Phnom Penh is deserving of its own. In my last blog post about Siem Reap, I talked a lot about ancient history but this blog post focuses more on Cambodia’s modern history back only 40 years. We got up early for a 6.30am bus and arrived at our hostel early afternoon. The bus was a local bus instead of a tourist bus which was interesting. Most of the way there we had Cambodian karaoke on the tv screen and then King Kong in English (minus the beginning and very very end). Once we arrived at our hostel, we pretty much jumped straight in a tuk tuk and went off on our afternoon of activities, grabbing some lunch on the way. 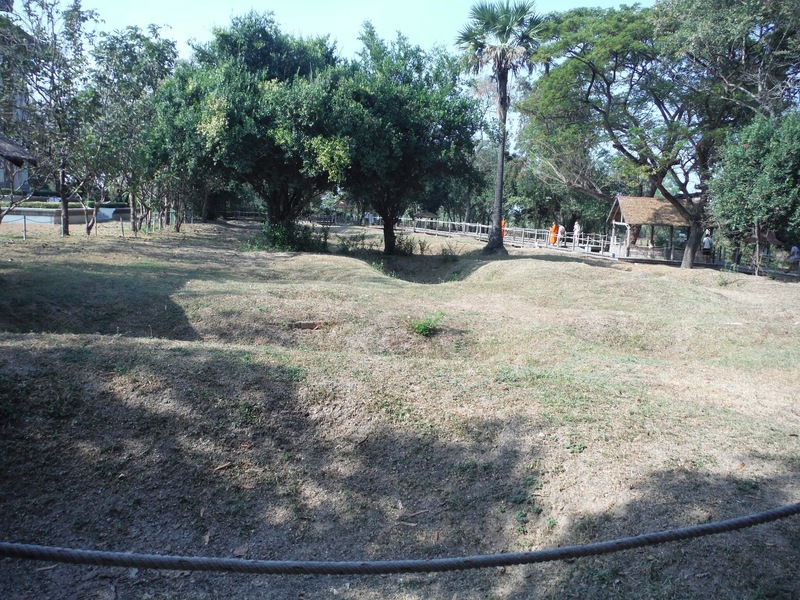 Our first stop was Choeung Ek also known as the Killing Fields. When we arrived, I thought about how weird it was that I was deliberately walking into a genocidal centre. I also thought about the thousands upon thousands of people who have also walked through these gates to never walk out again. 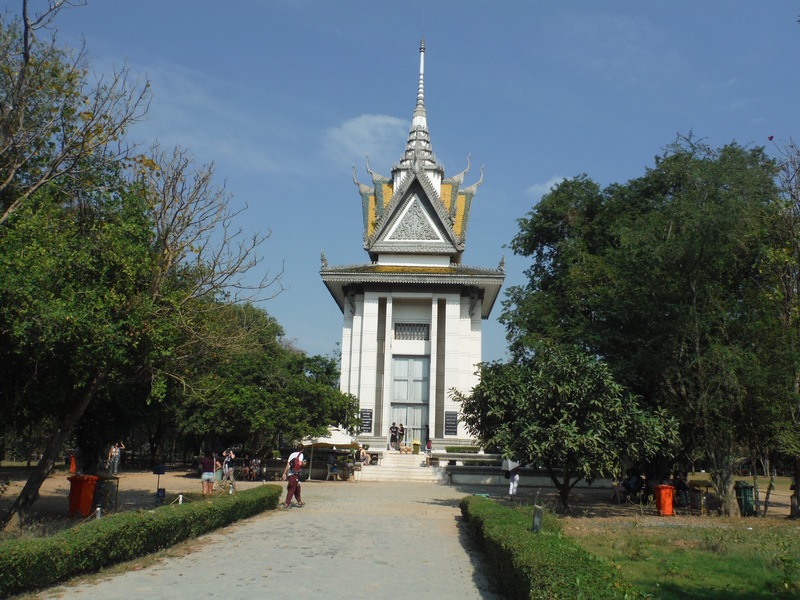 Choeung Ek is the most famous as it was the biggest at the time and now contains the biggest memorial in the country. In total, 3,000,000 of Cambodia’s 8,000,000 population died in these short years. When people were evacuated to the countryside, they were forced to work for about 12 hours a day and city folk had little to no training so many died from starvation or worked themselves to death. Money and personal possessions were banned. Prisoners arrived in groups, some of which had been tortured for weeks or even months and in the height of it all in 1978, up to 300 people arrived a day. Most of the guards were teenagers from rural areas as the educational level was low and they were more easily influenced. Every prisoner was well recorded and some prisoners even signed the roster themselves to make sure no one had escaped. All places like this were kept completely secret and revolutionary music was played to drown out the cries and moans. We had an audio guide as we walked around the site and learnt a lot about what happened whilst also hearing personal accounts from people. I think one of the hardest things to see here is what happened to women and children. If someone was found guilty of something (everyone confesses something after being tortured), the whole family had to be killed to prevent anyone seeking revenge. 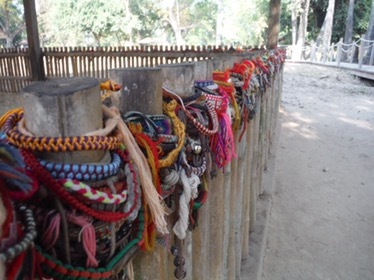 There were many mass graves but one in particular was for women and children. 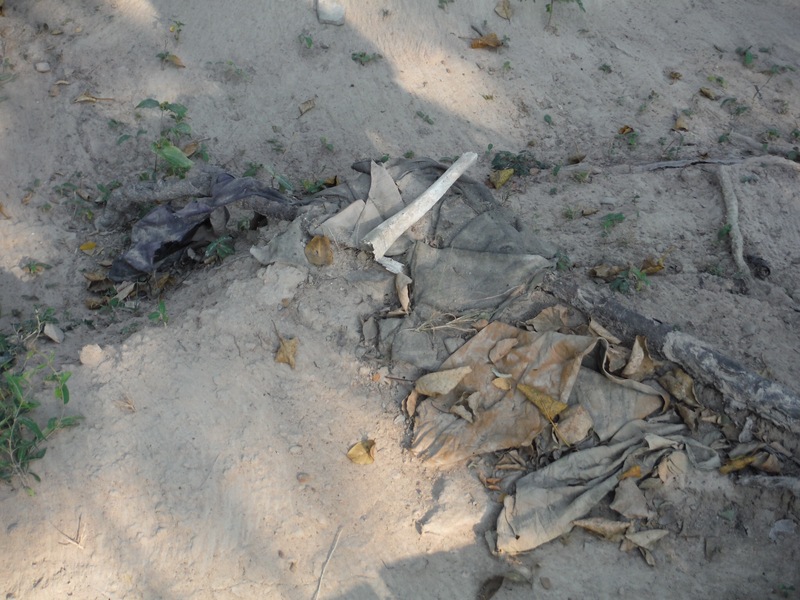 The women were all found naked, many of them raped and the children were smashed against a tree before being thrown in. 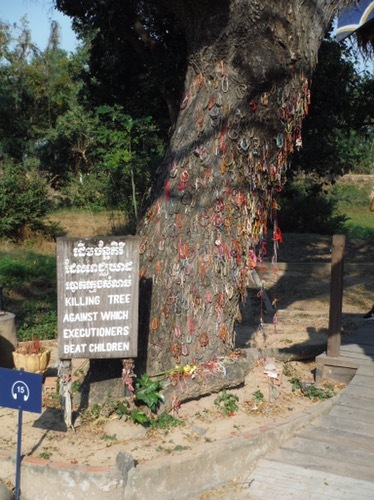 I had heard about this tree before going but seeing it with my own eyes was tough. 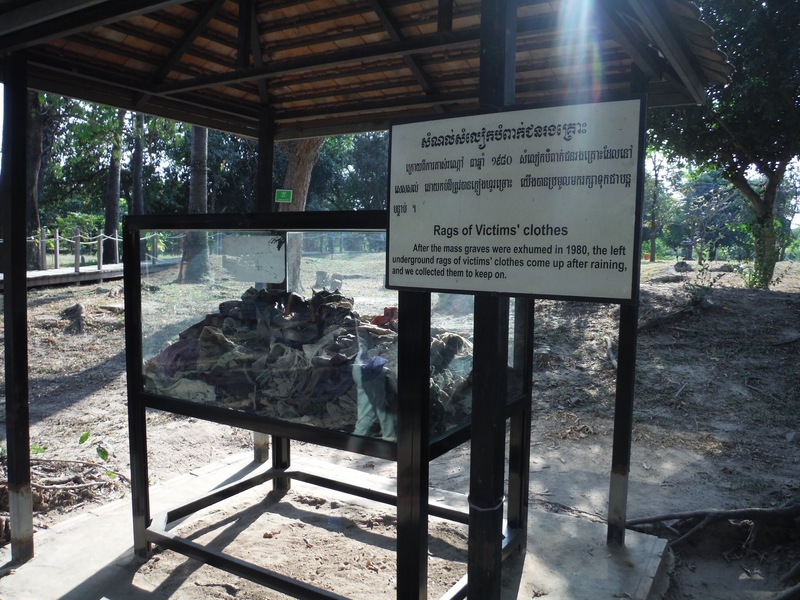 There is also a clear box where they display clothes that have emerged during the rainy season and you can see things like little children’s shorts and blindfolds. Although most of the remains have been dug up, some bones still rise to the surface every few months when it rains and some have been left for tourists to see. In the middle of the site there is a large memorial which has 11 levels of skulls and other bones along with more clothes and some of the instruments used to kill people. All the skulls are colour coded so you can see the gender and cause of death of each person. I think this was the worst thing as some skulls have large holes in and others have been completely smashed in. It made the whole thing very vivid. We got back in our tuk tuk and sat in silence for the next half an hour while we drove to the next stop. 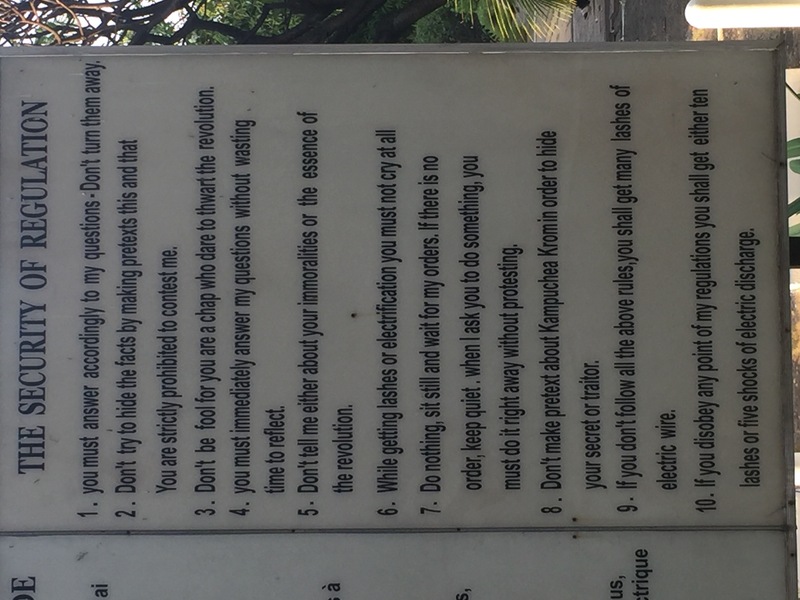 We arrived at the Tuol Sleng Genocide Museum also known as S-21 and got another audio tour. S-21 used to be a school and in ways still looks like a school. You can see buildings filled with classrooms and pull up bars in the courtyard but the first thing you see when you walk in are 14 unmarked graves. They are the 14 anonymous bodies that were left here when the guards fled in 1979. The bodies had been mutilated so badly that they couldn’t be identified and all the records had been burned. We walked in and out of the classrooms in block A which had nothing more than a bed where people were tortured, some chains and photos of the 14 bodies when they were discovered. Block B contained a photo gallery of both people who worked for Pol Pot and people who were killed by his regime. There were government officials, men, women, foreigners and children. It was so sad to see the faces of the children because many looked confused and some were even smiling which means that they had no idea what was happening. 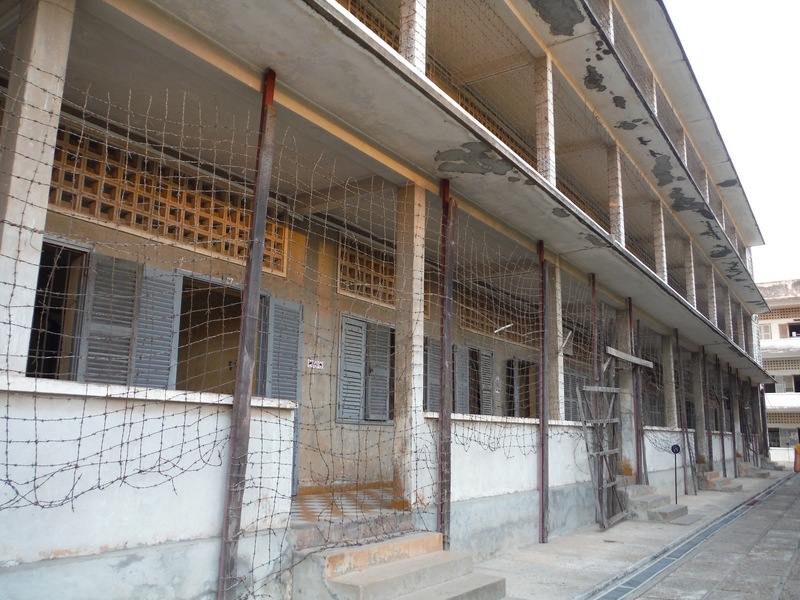 In block C is where all the prisoners lived. 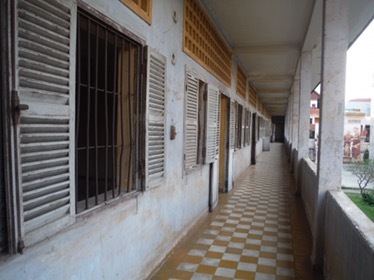 The Khmer Rouge had adapted the classrooms to be long corridors of small cells with nothing in them but an iron hook to attach the shackles. In some of the cells you can still see blood stains on the floor. The whole building is covered in wire so that prisoners can’t escape or jump to their death. In the final block D, there were artists impressions of what had happened at both S-21 and Choeung Ek and we could listen to more personal stories about people who had lost children and loved ones and about people who had survived. Again, we sat in silence on the way back to the hostel as we reflected on what we had seen. I think these two places are the most morbid places I have ever been to and it made me look at the people of Cambodia in a different light. Anyone aged around 40 or over will have experienced these awful few years and everyone will have a story to tell. I appreciated that whenever I paused my audio guides, both places were silent while everyone pays their respects. Normally I get annoyed with people taking disrespectful photos at these kind of places too but there was hardly any of that. I took only 11 pictures all day because it felt wrong to photograph a place where so much suffering has happened. The government encourages people to visit these two places. Not to make you miserable but to make people aware of the terrible crimes that have happened in the past and hopefully learn from it so that it is less likely to happen in the future. As I mentioned in my last post, Angelina Jolie has recently made a film about the Khmer Rouge and hopes that it will encourage people to talk more openly about their experiences with younger generations. If you want to know more about that, click here. The next morning I woke up feeling very well rested after our long day the day before so for the first time in a month and a half I ventured out and found a gym! It was $4.40 (including towels and a locker) and I was so happy to be doing exercise other than walking! I could have spent the whole morning there because my back has not been feeling good recently but I had to get back for our bus to Sihanoukville. After a bit of a kerfuffle when the bus company forgot to pick us up, we were on our way and, although I love history, I was excited to kick back and relax on a beach! Sorry that this post has been so morbid. I usually like to add a little humour in my blogs but it wasn’t happening with this one! I promise the next blog post is cheerier! That was really hard to read, but the people who died must not be forgotten. So difficult to read about what happened in Cambodia. I do plan to visit but know how hard it will be.